Forecast: Princess Roi shortens to a sprint for the first time since the summer of 2016 and we suspect the Baltas-trained mare will enjoy the change in trip. Freshened since October and showing a solid, healthy work tab, she should be prominent throughout in a race that projects to have a comfortable pace scenario. Ficanas roared from behind to graduate from a modest field in her U.S. debut over this course and distance. These are tougher, but the English-bred filly has just three career outings on her resume and should have plenty of room for further improvement. 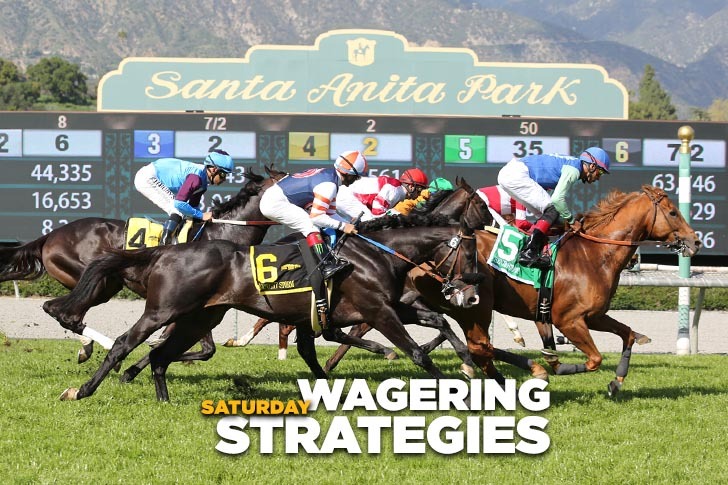 Merger Arbitrate finished a strong runner-up in a similar Hillside sprint in late February and not much more will be needed to put her right there. Forecast: Ferguson was claimed for $35,000 in his last start in February and today surfaces for $16,000, hardly a healthy pattern. If the Koriner-trained horse has one good one left, he certainly can win at this level, but that may be a big if. Hey Sequoia is another class dropper seeking his proper level. He has the route-to-sprint angle that we like and numbers that fit, so he’s a major player. We’ll try to get by using just these two in rolling exotic play. Forecast: ​Rather Nosy was five lengths clear of a next-out winner when runner-up in a similar starter’s allowance sprint over a wet track in her most recent start; before that she graduated on fast going here in good style. We’ll put her on top while also including Tiza a Master. The Morey-trained filly was overmatched in the Cal Cup Oaks on grass last time out but is back sprinting on the main track against a much lesser group today and should regain her best form. She’s won three of five lifetime starts and has a good stalking style that works well at this trip. Forecast: Honeyfromthesouth burned quite a bit of money in two starts since joining the Baffert barn via private purchase last fall, but she returns sans blinkers while sporting a work tab that should have her fit and ready. The daughter of Fed Biz has speed figures that are more than good enough to beat this field and likely will go lower than her morning line of 5/2. Miss Ava’s Union flashed ability in her debut when a solid runner-up in a decent race for the level and has a right to produce a forward move for Baltas. Away since later December but training well at San Luis Rey Downs, the daughter of Union Rags probably will do her best down the road two-turning but is worth including on a ticket or two as a back-up. Forecast: Catapult should have this field over a barrel. The veteran son of Kitten’s Joy was an excellent runner-up in the Breeders’ Cup Mile two races back and then was the victim of an ill-timed ride when moving way too soon and then paying the price late in the Pegasus World Cup Invitational at Gulfstream Park in January. He’s reunited with Van Dyke, who fits him best, and drops back to a mile, his preferred trip. At 8/5 on the morning line and likely to go lower, the Sadler-trained horse is a logical short-price rolling exotic single. Forecast: ​Kanthaka is a prototype late-running sprinter and is especially lethal at this seven-furlong distance. With plenty of speed signed on to compliment his style, the son of Jimmy Creed looks capable of producing the last run. Ax Man got a confidence-building win in a tough allowance race over this track and distance in early February and has been kept on edge with a series of solid drills since for Baffert. The son of Misremembered looks the most dangerous of the pace types. Forecast: Zaffinah seems to be improving with age and ran her best race to date when a strong third to Vasilika in the Megahertz S.-G3 in January. This 10-furlong trip should be within her range, so let’s go with Carava-trained mare on top in an open affair that requires a spread in rolling exotic play. Streak of Light has two prior wins over this course, so the Chew-trained filly is a major player with anything close to her best race. She has a good stalking style and projects to inherit a nice ground-saving trip from her inside draw. Elysea’s World is getting up in years and may have seen better days, but her back class must be respected. She switches to Van Dyke and may be the most dangerous of the deep closers. Forecast: This a tough, contentious middle-distance main track allowance event with several possibilities. We’ll use three and hope that’s enough. Popular Kid is a tough-as-nails veteran with five career wins over the local main track. He didn’t fire over a sloppy track vs. similar last time out but a repeat of his race before last might be good enough. Air Strike adds blinkers for the first time in his first start since late December and is fast enough on pure numbers to make him a strong contender. The son of Street Sense is lightly-raced with upside and should be within striking range throughout. Nero is another with good form and numbers that fit. He’ll be a pace factor throughout. Forecast: Selcourt stretches out for the first time and seems the likely controlling speed. On pedigree she should stay at least a mile, and in her fourth start off a layoff the Sadler-trained mare should be primed for her best. Marley’s Freedom just beat Selcourt in the Santa Monica S.-G3 at seven furlongs but today – like Selcourt – she’ll be trying two-turns for the first time. She’s by Blame, so why shouldn’t she handle it? They’re tough to separate so we’ll use both while slightly preferring Selcourt on top. Forecast: Hello Bubbles has the perfect style for this downhill turf course and should be along in time as a straight play and rolling exotic single. The Drysdale-trained daughter of Munnings finished a strong third in her only outing over this course and distance and a repeat of that effort last fall will be good enough. There’s value her at 7/2 on the morning line if you can get it.